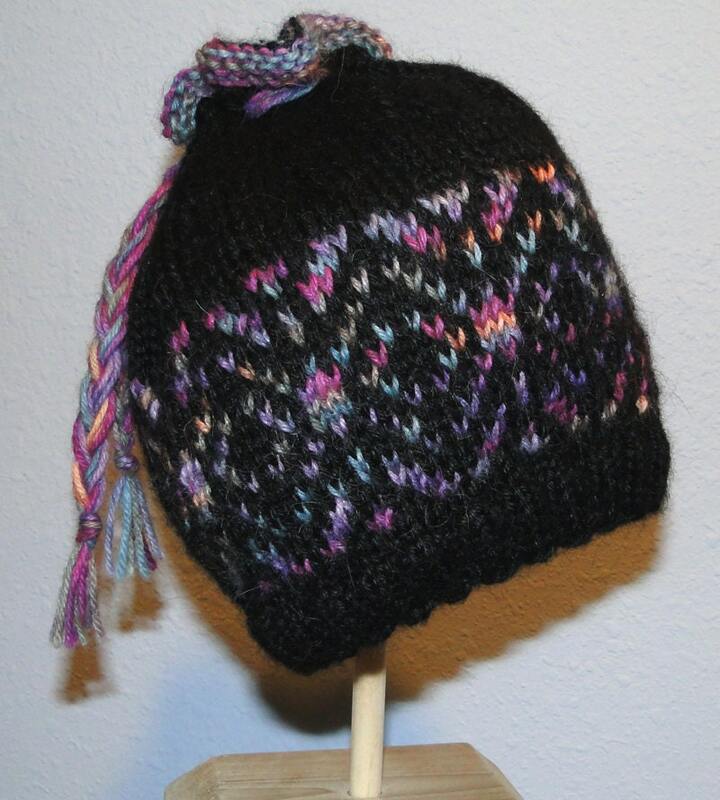 Perk up your winter attire with this lively hat pattern. The entire pattern is knit in-the-round but the cinched top-knot does not require switching to dpns to finish the crown. You are welcome to sell the finished product that you make using my pattern. The pattern includes a chart for the stranded (fair isle) portion, while the rest of the pattern is given as written instructions. Skills needed are knitting in-the-round, 2-color stranded knitting read from a chart, K, P, SSK, YO, and K2tog. I used sizes US5 and US6 needles. My gauge on US6 needles was about 5 stitches per inch. This hat should fit most adult women. The hat shown was knit using one skein each of Black DK-weight Classic Alpaca Yarn and Hand Painted DK-weight Alpaca Yarn in Desert Sunset. Both of these yarns are available for purchase in my shop. This pattern is my original design and is protected by US Copyright law. The pattern instructions and/or photos may not be copied, reproduced, sold, or distributed in any form without my express written permission. I designed this pattern with a sunburst in mind, but it took on an icelandic alpine air as it evolved. Thanks to mamahobbit for the great Kaleidosnow name suggestion. Thank you for visiting The Alpaca Yarn Shop! Easy pattern to follow. I'm excited to find a yarn to start project! Thank you. Beautiful color, soft texture, and easy to work with. I just wish there was more of it to a hank! Very soft and easy to work with. Gorgeous color. Fast shipping too. I wlll definitely order again. Beautiful color, soft, and very easy to work with. Fast shipping too. 8.8% sales tax will be added to all orders placed from Washington state, USA. PayPal and Credit Cards are accepted for payment through Etsy's Direct Checkout system. If you are not satisfied with your purchase, I welcome the opportunity to work with you to find acceptable solutions. No returns or exchanges for patterns or pattern kits. For yarn, return or exchange requests will be honored if made within 3 days of receiving the item(s). Item(s) must be unused and in original condition with label(s) and original packaging. Shipping charges will not be refunded. Customer also pays for return shipping. I photograph the yarns that I sell using a light box in order to portray the truest colors in my photos. However, computer monitors may display colors differently, so the actual yarn may differ somewhat in color compared to what you see on your screen.